Be sure & visit Jenn & Kellee at www.teachmentortexts.com for more great #IMWAYR participants! Spring break equaled lots of reading in the car, on the beach, at the pool... divine! It was definitely a varied week of reading, with an unusual focus on middle school titles. Usually I read more YA/High school titles but not last week! Walking Disaster was the only YA title. 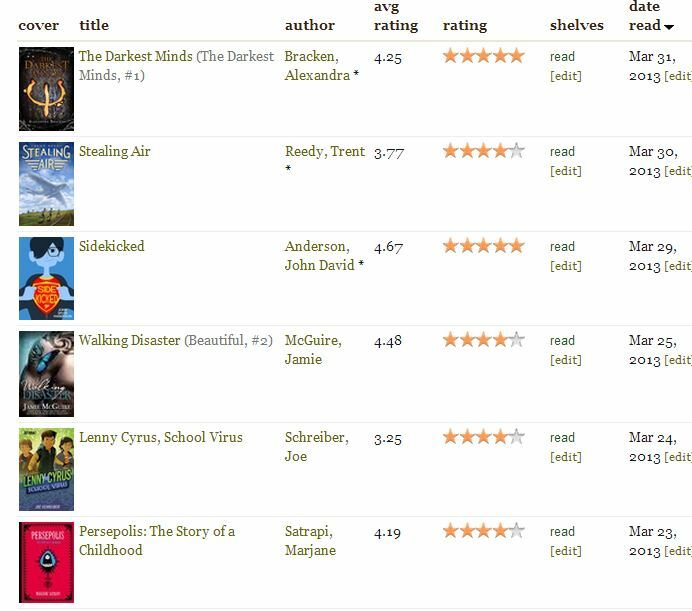 Darkest Minds fits both middle and high school ages...much like the Hunger Games and Divergent series. My most favorite 5 heart awesome reads of the week? Know what else I read? Wrinkles Wallace: Fighters of Foreclosure by Marquin Parks! Nope, not an ARC -- the soon to be published manuscript (thanks, friend!) I smiled, laughed, and enjoyed seeing how the characters had grown since Wrinkles Wallace: Knights of Night School. I am really NOT avoiding Homeland...still don't have a copy to read. My public library is processing theirs and my school library copy has yet to arrive. :( My son and I are reading Seagulls Don't Eat Pickles together. I haven't yet started Hold Fast but after Colby Sharp described it as "The Mighty Miss Malone meets Wonder" in his 5 favorite middle grades books of the first quarter, how can I NOT read it? I hope you have a great week filled with wonderful books!